It’s fall – time for the many native plant sales around the state. These are great places to purchase native plants at reasonable prices. Here are some links for a few of the local sales. Sat., Oct 14, 2017, 9:30am – 2pm. 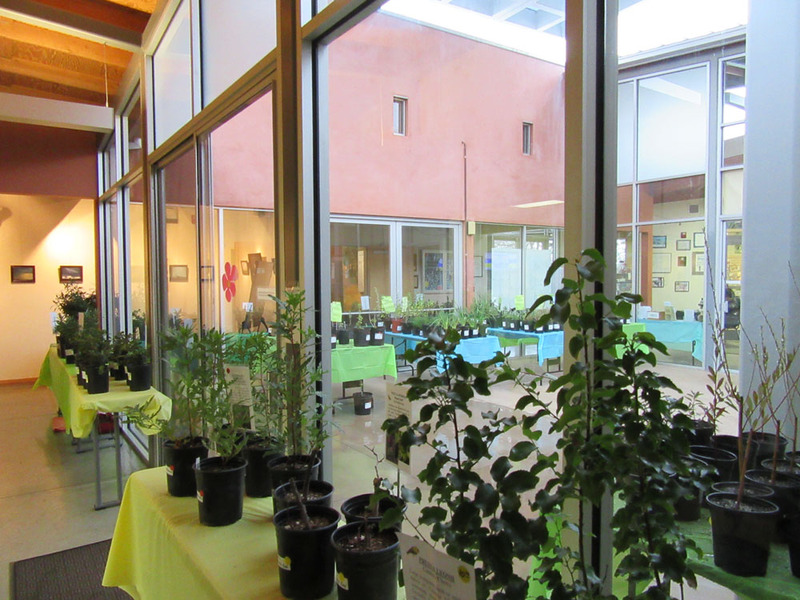 Friends of El Dorado Nature Center Native Plant Sale. 9:00 – 9:30 Preview time for Members of Friends of El Dorado Nature Center. Memberships available at the door. California Native plants suitable for our area, including many drought-tolerant plants, will be for sale along with a wide variety of unusual drought-tolerant succulents from around the globe. All proceeds support the Friends of El Dorado Nature Center habitat enhancement programs. For more information contact Donnie Haigh at (562) 570-1745 or 570-4885. If you live outside our area, check with your local native plant society or college/university to see if they have a native plant sale. California Gourmet: Homemade Applesauce – Yum! If you follow our blog, you know that our garden specializes in native plants suitable for S. California gardens. So this topic may surprise you, particularly if you haven’t actually visited Mother Nature’s Backyard garden. The one non-native plant we grow is an ‘Anna’ apple (Malus domestica), trained as an espalier along our cinderblock wall. 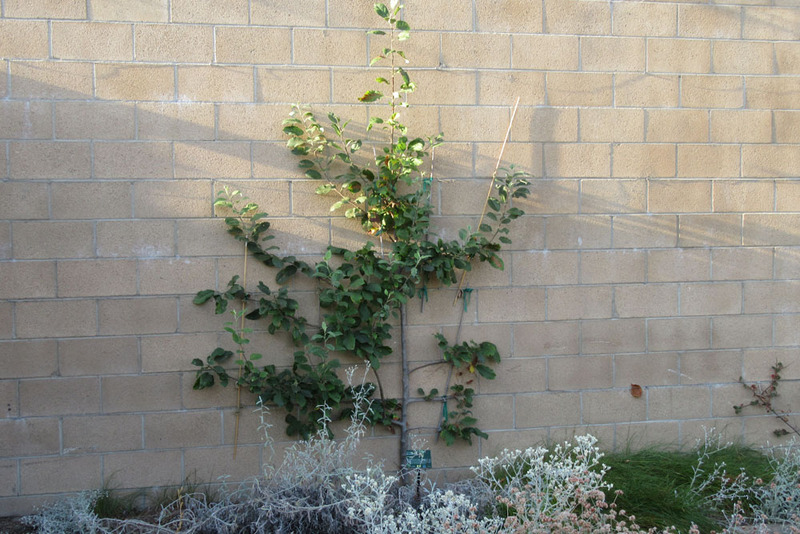 The apple tree demonstrates how native and non-native woody plants can be grown in very narrow spaces. Since ‘Anna’ is a low-chill apple, it grows well – and produces apples – even in S. California. Our ‘Anna’ is relative young (6th year) and most of our apples thus far have been picked by others (human or animal). 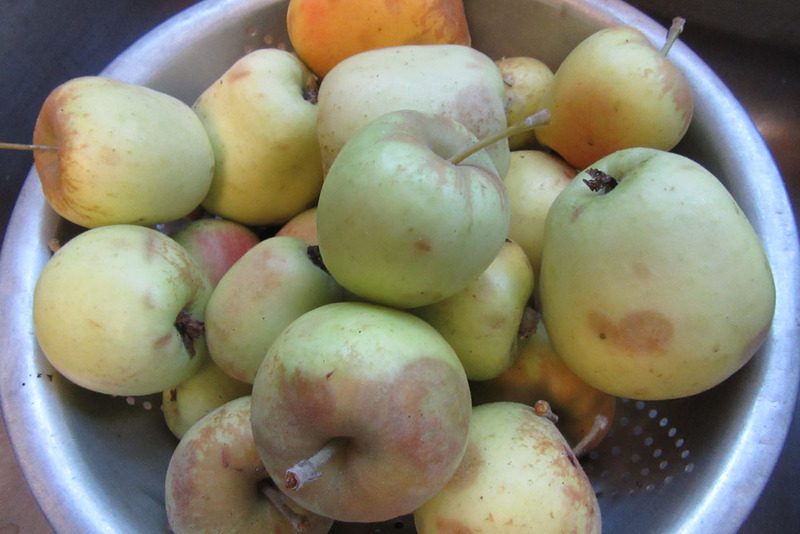 Fortunately, one of our members has a mature ‘Anna’ in her backyard – and a bumper crop of apples this year. So this is a good time to talk about making homemade applesauce. It’s easy, fun and we think the product is superior to the store-bought version, both in taste and nutrition. Making applesauce is really simple. Back in the day (1950’s and 60’s), girls learned to make applesauce in home economics class (too bad for the guys – they had to take wood shop!). I suspect that many older readers learned to make this treat in school. And if 7th grade girls in the Pomona Unified School District managed to make applesauce, then you can too! It’s a great way to use a bumper crop (or less-than-perfect) apples. 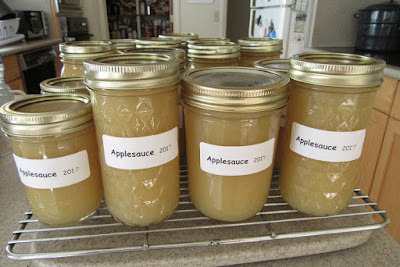 And applesauce that’s been properly preserved can be safely stored at room temperature for 1-2 years – another benefit. Applesauce can be made from any type of apple. You can purchase your favorite type – or use whatever apples you have available (you can even mix varieties). You can also make your applesauce as sweet as you like, by adding the appropriate amount of sugar or other sweetener. You can also add spices (cinnamon; ginger; etc.) or other fruits, if desired. In short, you can tailor your applesauce to the needs and tastes of the applesauce eaters. Here’s our homemade applesauce recipe, with some notes and tips below. 1. Thoroughly wash apples. Cut out any damaged areas. Quarter and remove stem and seeds (we leave the skins on for better flavor). Slice the quarters into ¼ inch slices; place slices in heavy pot or saucepan (large enough to fit all the apple slices with about 2 inches to spare)*. 2. Fill pot with water to barely cover the apple slices. 3. Heat pot on medium-high heat on stove until water starts to boil. Stir occasionally. 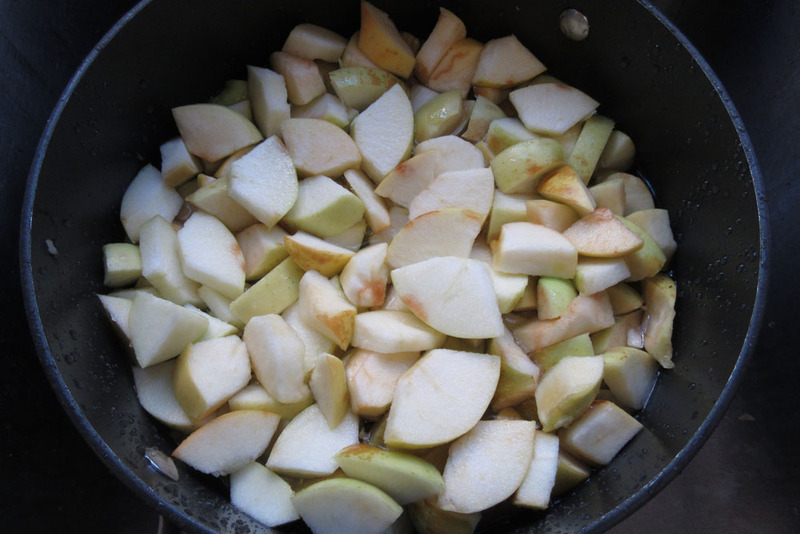 Turn down the heat and simmer until the apples are cooked (mushy texture)*. Stir as needed to keep mixture from burning on the bottom. 4. Remove from heat. 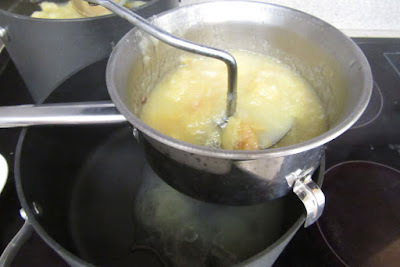 Mash the hot apple mixture through a sieve (use a spoon and be careful – it’s hot!). An easier way is to process the apple mixture using a food mill. * The texture will now be smooth and ‘applesauce-like’ (but a bit runny). 5. 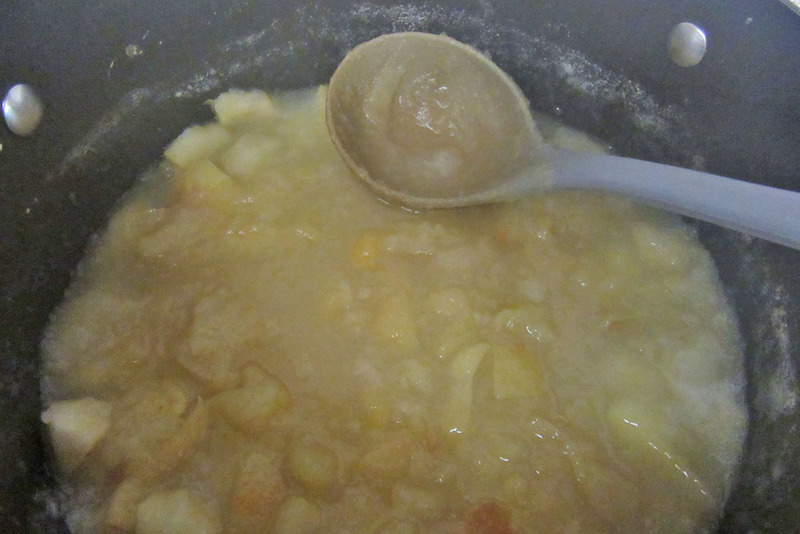 Return the apple mixture to the pot. Add sweetener and spices (and/or berries) to taste. 6. Heat over low heat, stirring regularly, until mixture is the consistency you like. Be sure that the mixture comes to a boil (to kill any microbes). 7. If preserving, ladle hot mixture into sterilized jars, cap with two-part canning lids and process in boiling water bath (10 minutes for elevations below 1000 ft.; add 1 additional minute for each 1000 ft. above 1000 ft.)*. Store preserved applesauce in a cool, dark place (room temperature) for up to 2 years. 8. If not preserving, cool the applesauce, then store in a closed container in the refrigerator for up to 2 weeks (if not gobbled up long before). 1. 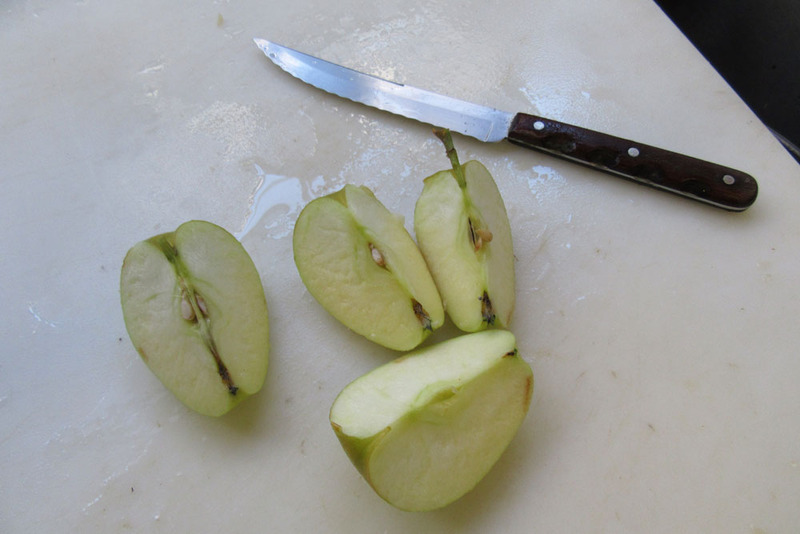 Here’s what the sliced apples should look like. They cook quickly if sliced. 4. The food mill is a great piece of equipment if you do a lot of puree work. It’s a simple, old-fashioned tool and uses no electricity. Food mills are made by a number of manufacturers and available in stores and online. We use the Foley mill; it’s sturdy and lasts a lifetime. Here’s what ours looks like. Perennial mints are choice summer plants. In addition to attracting pollinators, native mints provide wonderful flavors for herbal teas, beverages and desserts. Blooming in a shady spot in the Garden of Health is one of our favorites, the Mountain mint or Pycnanthemum californicum. The scientific name is pronounced pick-NAN-the-mum kal-ee-FOR-nee-kum. 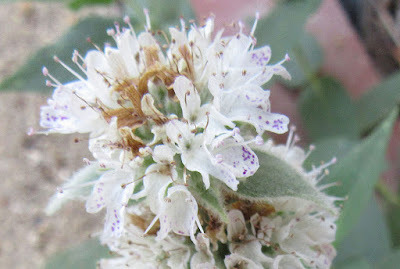 California mountain mint is the only Pycnanthemum native to California. While limited to N. America, most Pycnanthemums grow in places with more summer precipitation than S. California (we’re lucky to have even one species). The genus is classed in the mint family (Lamiaceae), which includes the California native Lepechinias, Menthas, Monardellas and Salvias. Like many mints, Mountain mint has pleasantly-scented foliage, traditionally used as both a flavoring and medicinal agent. 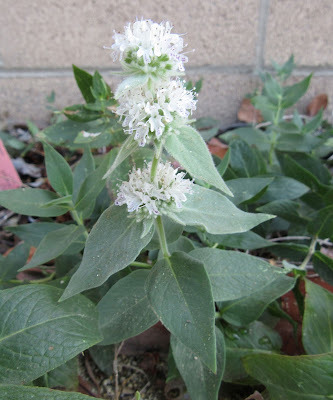 Pycnanthemum californicum is commonly known as Mountain mint, Sierra mint, California mint or California mountain mint. Several other native mints are known as ‘Mountain mint’, so be sure to use the scientific name when purchasing this species. California mountain mint is endemic to the mountains and foothills of California, including the central and northern Sierras, the Klamath, Modoc and Coastal Ranges of northern California, and southern California’s Transverse and Peninsular Ranges. In Los Angeles County, it grows in the San Gabriel Mountains and foothills, and is common in the San Antonio Canyon above Claremont and in Lytle Creek Canyon (San Bernardino County). It always grows in relatively moist sites, in chaparral, oak woodland or pine forest communities, between 1500 and 5500 ft. (500-1500 m.) elevation. 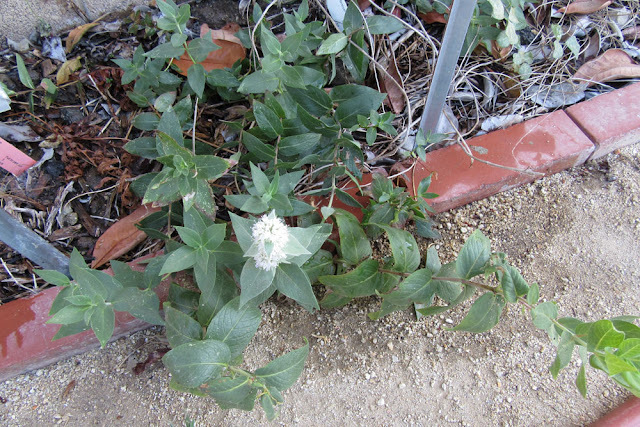 California mountain mint is a true perennial. In our garden it dies back to the ground in fall, emerging again in late winter or early spring. The emerging stems have the typical appearance of winter-dormant perennial mints (small, compressed leaves on multiple, emerging stems – see above photo). In many ways, Pycnanthemum californicum is a fairly typical mint. It has square stems, opposite leaves, and flowers in ball-shaped clusters. 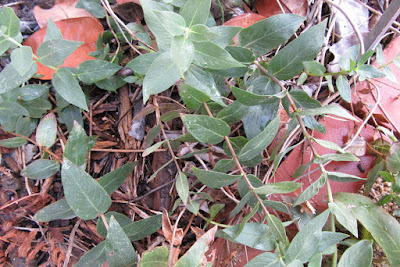 The stems are slender and may be upright or draping/sprawling. 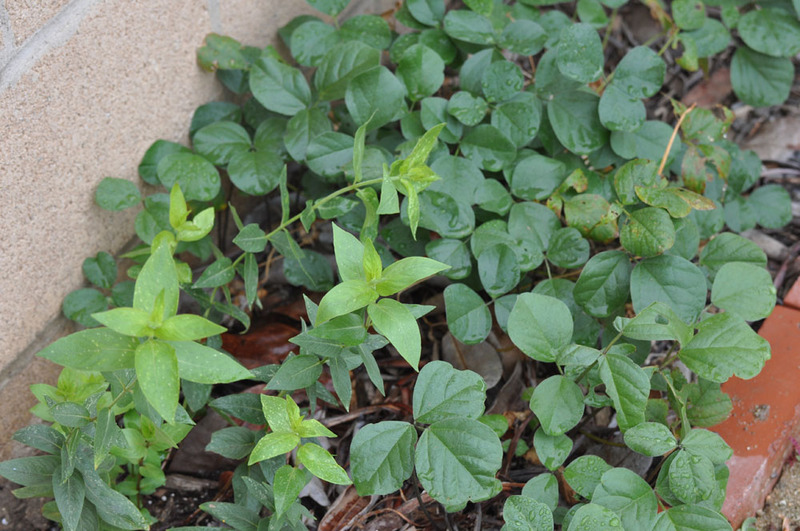 Plants add more stems each year and mature plants may become almost shrub-like in appearance. The stalks can be up to 3 ft. (1 m.) tall, but are rarely more than 12-18 inches in our garden. 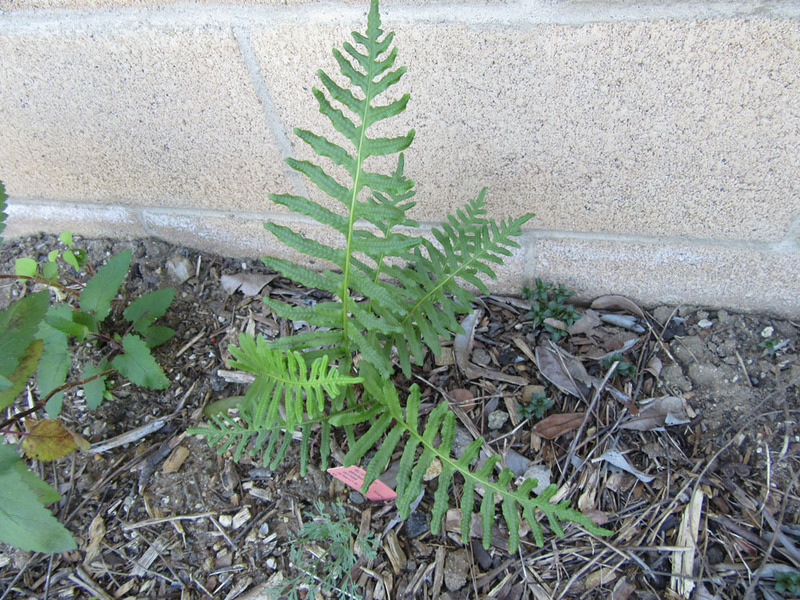 young foliage (note fine hairs). The leaves are simple, lance-shaped to oval, and up to 1 ½ inches (2-3 cm.) long (or perhaps a little larger in shady conditions). 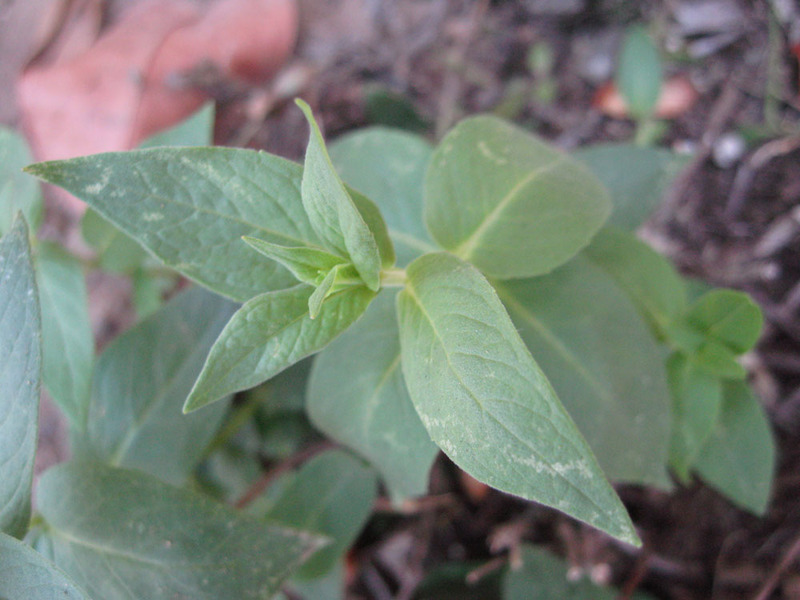 Young leaves are a pale mint green, with mature leaves becoming medium green. Some leaves – including those with more sun exposure and the younger leaves – are covered with clear, velvet-like hairs. In the Garden of Health, leaves are slightly shiny and almost hairless at maturity (see below). Unlike the herbaceous Mentha species, the stems of Pycnanthemum californicum are partly woody and wand-like. 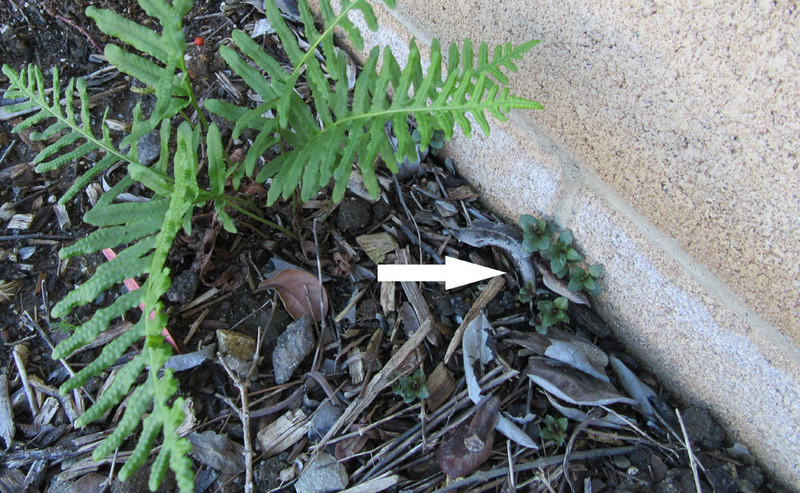 The stems are a pale red-brown. 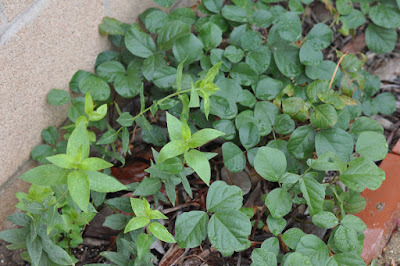 The overall appearance, at least in part-shade, is that of a low perennial groundcover. The foliage is aromatic, with a unique minty aroma. The scent is released by touch – a good plant for along walkways, under garden benches or in shadier areas of an herb garden. It even takes some foot traffic. Like all mints, the flowers grow in ball-like clusters around the stems. In California mountain mint, the floral masses grow immediately above clusters of small leaves (see above). The word Pycnanthemum means ‘densely flowered’, a good description for the flowering habit of this genus. Each flower cluster has 40-50 or more small flowers. The overall impression is ‘white’, but the flowers merit closer inspection. The individual flowers are small (less than 5 mm across), with the characteristic modified flowers of the Mint Family. The top two petals form a top ‘lip’, which is white and extends forward in this species. The bottom three petals are fused to form the bottom lip, which may have small purple dots or blotches (see above). The bottom lobes are fairly elongated in Pycnanthemum californicum and they curve backward at their tips. Several pairs of anthers (male sexual organs) extend beyond the lips (also typical for the Mints). The result is a charming little flower that’s perfectly suited for butterflies, hummingbirds and other native pollinators (including pollinator flies and moths). Like other Mints, the Pycnanthemums are often planted as shade-tolerant pollinator plants. They are a good choice, providing nectar in late summer/early fall, when other resources may be limited. works well with native ferns and California bee plant. Pycnanthemum californicum likes some shade, at least in our hot S. California gardens. We grow ours on the north side of a tall wall, but any place with afternoon shade, bright shade or dappled sun will do. It can be grown in most soils; it certainly is happy in the clay-loam in our garden. The only conditions that might not be suited are salty or alkali (pH greater than 8.0) soils. Mints often do well in somewhat compacted soils, making them useful agents to loosen urban soils. The California mountain mint does need more water than many local native species. It can take regular water and will probably be lusher with moister soils. We give ours a deep soak every other week in hot weather, so the ground dries out between waterings. It seems to do fine with this regimen, in a clay soil with afternoon shade. We grow ours with water-loving native ferns, California bee plant (Scrophularia californica), the Heucheras and other perennials with similar shade and water requirements (see above). Pycnanthemum californicum is the perfect choice for naturally moist areas of the garden: under splashing fountains, around ponds, near an avian water dripper or mister, etc. It even tolerates seasonal flooding – so an irrigated rain garden or swale is another easy spot. It would be right at home along the edges of a watered lawn or in a flower bed that gets regular irrigation. Mints also do well in containers and Pycnanthemum californicum would be charming in a shady porch pot. We like it as a filler in a narrow, partly-shady bed between a wall and walkway. Or grow it as a seasonal ground cover in the shade of a Blue elderberry or other tree. You might even consider creating some ‘mint beds’ in your herb or vegetable garden. True foodies can’t have too much mint in a garden! Which brings us to the useful nature of this charming little mint. Its unique and lovely flavor has traditionally been used for tea and to flavor beverages, desserts – even meats. The leaves and flowers can be used fresh or dried. For more on using mints for tea see: http://mother-natures-backyard.blogspot.com/2012/06/making-tea-from-california-native-mint.html. If you like the flavor, you might want to preserve some for use all year long. Here are some tips: http://mother-natures-backyard.blogspot.com/2016/04/california-gourmet-making-flavored.html. 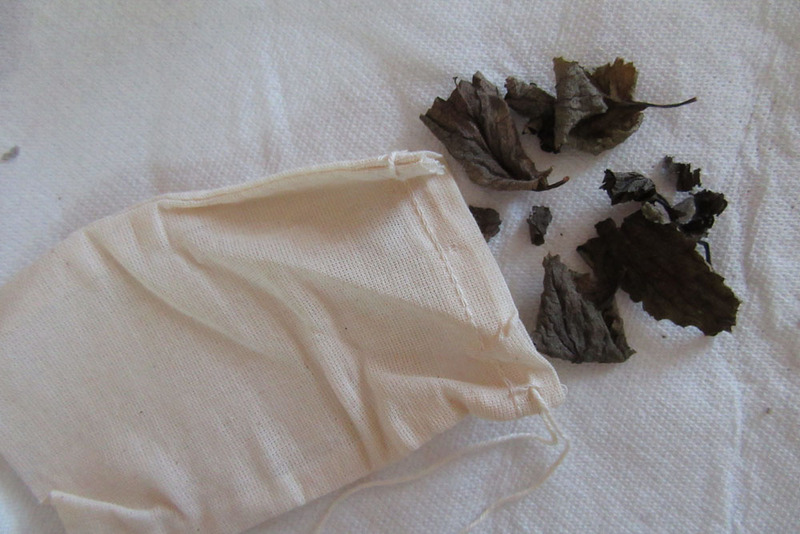 The scent of dried leaves is a lovely addition to potpourri sachets. The dried leaves even help to deter moths! To learn about making potpourri from native plants see: http://mother-natures-backyard.blogspot.com/2013/11/garden-crafts-making-potpourri-from.html. To sooth dry skin, use fresh or dried leaves and flowers as a bath sachet (place in cloth bag; let steep in warm bath water). You can also use a sachet of dried leaves to freshen laundry (use a sachet bag in the dryer) or to deter moths in closets or linen drawers. potpourri from dried leaves can be used in many ways. But California mountain mint is more than just a flavoring/aromatic agent. Like most mints, it has a long history of use as a medicinal plant. The plant makes an astonishing number of plant chemicals, some with known antimicrobial, antifungal and other medicinal properties. So it’s not surprising to learn that medicinal teas (decoctions) made from Pycnanthemum californicum are used in a number of ways. Because of the many chemicals, mints should not be used by women who are pregnant. Pycnanthemum tea is a good ‘pick-me-upper’ – a tonic for when you’re feeling a little tired or run down. The tea is also used for coughs, colds, fever and indigestion. The combination of antimicrobial, analgesic (pain relieving) and other chemicals probably explain its affects. A strong decoction was traditionally used as an antiseptic wash for skin wounds, mouth sores and gum disease. Crushed flowers were placed on a tooth to relieve toothache. For more on the medicinal uses of this plant see references 1-2, below. 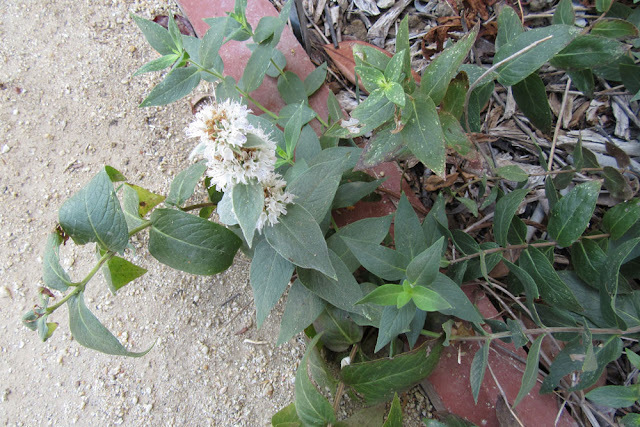 California mountain mint (Pycnanthemum californicum): much to recommend it! In summary, California mountain mint is a summer-fall blooming plant with many useful properties. It provides nectar and seeds at a time when many natives have gone dormant. It can be used in places that are shady and which get a little extra water, and can be combined with plants with similar needs (native or not). And it provides scents, flavors and helpful chemicals – what a bargain in a single plant! It’s not a showy plant, but it’s a garden star none-the-less.